I've previously blogged about this tiny Muslim restaurant off Thanon Charoen Krung, but having recently been reminded just how good it is, not to mention the fact that it always seems to be empty, felt compelled me to do a re-run. 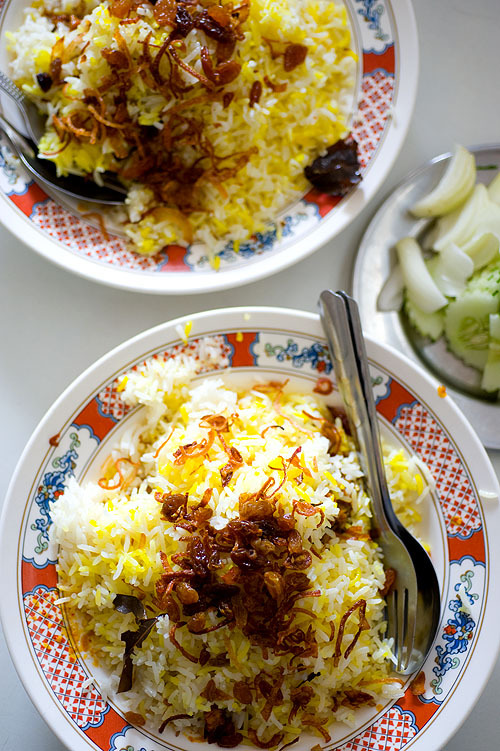 The dish to order here is khao mok, biryani, in particular, the goat version (pictured above). The rice here is perfectly-cooked, pleasingly oily (with ghee, I suspect) and fragrant, and studded with raisins, cashews and dried spices, while the joint of goat is fall-apart tender and sits beneath the rice in a puddle of rich curry that eventually soaks into the rice, bringing the dish together. It's served with slices of cucumber and onion and a slice of lime and a wonderful homemade relish that's equal parts sweet and sour. There are a few other similar, although not quite as tasty Muslim places in the area, including Fatima, Muslim Restaurant and Home Islamic Cuisine.